DESCRIPTION Beautiful and immaculate walkout bungalow at Monterra on Cochrane Lake. This home sits on a corner lot backing onto green space. A view of the Rockies and Cochrane Lake provides a pleasant ambiance of spaciousness and the country lifestyle. Inside the open plan, 10’ ceilings and large windows enhance the attractive kitchen, maple cabinetry, granite counters, and hardwood floors. Other main floor rooms include a Master Bedroom with access onto the large south deck, a second bedroom, dining room, den/office, and laundry. Downstairs you are greeted by a warm and inviting family room with wet bar, two bedrooms, a den and utility room. Walkout to an exterior, covered patio and south back yard. The 3 bay Over Size garage is spotlessly clean and bright, with easy access to outside storage shed. A large RV parking stall is located on the east side of the garage. Home for sale at 59 Monterra Cv Cochrane Lake, Alberts T4C 0A4. 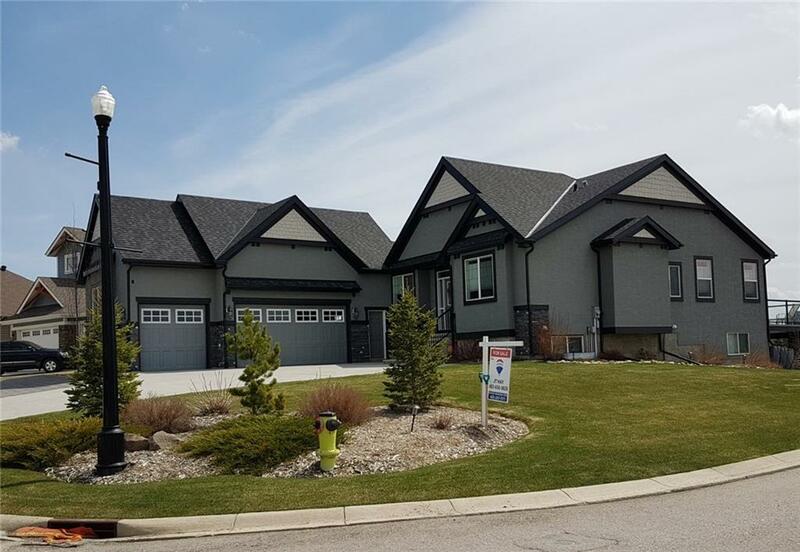 Description: The home at 59 Monterra Cv Cochrane Lake, Alberta T4C 0A4 with the MLS® Number C4224967 is currently listed at $939,000.